As we all know, you can’t fix what you aren’t measuring. But, with MES, we take this even further. Simply put, you need to know what you need to know, who needs to know it, and how they need to know it. Thus, as part of MES, downtime tracking takes you beyond just your operator knowing you have a machine that is not running and then him or her documenting what happened that caused the machine not to run. With performing downtime tracking as part of an MES, information is collected and shared about what machines are down and what caused the downtime in each instance. For example, during a 30-minute period, you may experience multiple causes of downtime including a machine jam, a bottle that exploded, and a part that fell on the floor. By tracking these incidents and reporting this information to the plant manager instead of just the machine operator, you can identify the machine(s) that are preventing your production line from operating efficiently. 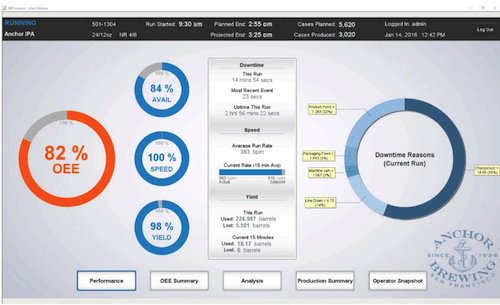 A screenshot of downtime tracking, along with Overall Equipment Effectiveness (OEE) data, implemented at Anchor Brewing. You can then take the data produced from downtime tracking and make the production processes more effective by addressing issues with problematic machines or processes. You can even use this data to justify investing in replacement equipment. Additionally, this shared insight into the causes of downtime on the plant floor enables company-wide, big-picture thinking since everyone, from operators to the CEO, are working from the same set of information. In our next post, we will look at how data entry automation can improve plant efficiency by allowing manufacturers to collect information directly from the machines on the line. Download our 9 MES Tools Every Plant Manager Needs to Improve Business Performance white paper for an in depth look at all the essential MES tools for increasing business performance.